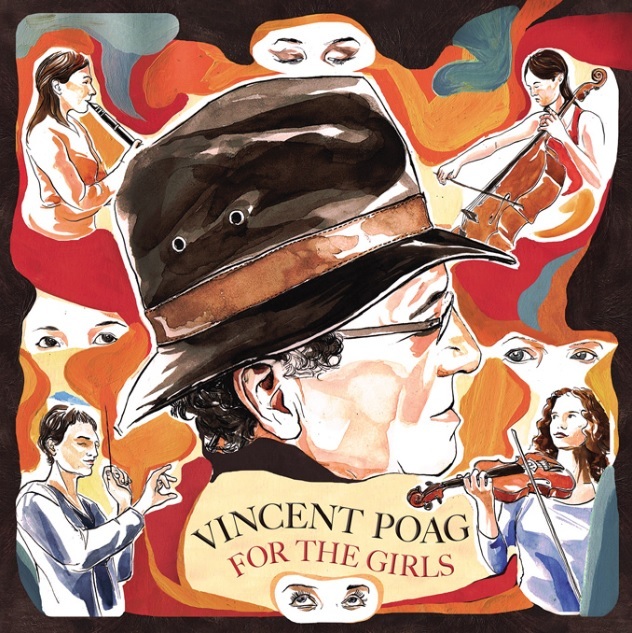 Singer/songwriter Vincent Poag’s new album For The Girls is an album for the people. His second full length studio release, it is one of the year’s absolute best new albums. The album’s run time comes in at roughly thirty-six minutes. That hardly makes it the longest album ever crafted by an artist, band or group. But the sheer musical and lyrical depth of the album’s thirteen total songs one of the most extensive albums released so far this year. Poag doesn’t stick to just one style of song from one track to the next on this record. Every track is different from the one before. And this should come as no surprise considering Poag’s influences. Those influences range from names such as Bob Dylan and The Beatles to even George Gershwin, Cole Porter, and Rogers and Hammerstein. Each of their influences is evident at one point or another throughout the course of the album’s barely half-hour plus collection of tunes. Audiences can clearly hear the Dylan influence right from the album’s outset in the song ’45 Mile An Hour Girl.’ The influence of Rogers and Hammerstein comes in the form of ‘Waiting For Me.’ And one could argue that Poag’s musical tribute to New Orleans would make even Cole Porter proud. Porter was known more for other styles of jazz. But Dixieland jazz is still within the jazz realm. So by that logic, Porter’s influence is still evident in the inclusion of this tune. The songs noted here are each wonderful additions to Poag’s new album in their own right. There are ten more songs on the album from which audiences will find their own favorites. Regardless of whether those favorites be among that group of songs or among the trio mentioned here, one thing is certain: All of the songs that comprise For The Girls collectively make this one of 2014’s best new albums. Vincent Poag’s biography notes that one of the biggest influences in his musical life is Bob Dylan. That influence is evident right off the top of this album in the song ’45 Mile An Hour Girl.’ Poag sings fondly of an unnamed woman in this song. The song’s very first line is short. But it speaks volumes. He sings, “She’s a forty-five mile an hour girl/I’m a seventy-five mile an hour guy/She’s carefully balanced/Not to stumble or fall/I’ve tried to catch the world on the fly/She’s that delicate blend of lover and friend/With a class that’s as far as is wide/She a forty-five mile and hour girl/And together we’re off for a drive.” The use of the harmonica and guitar is the most obvious evidence of that influence from Dylan. Poag’s vocal style adds to that influence. He actually sounds slightly like Dylan as he sings. Even more interesting, one could also compare his vocal style to a mix of Elvis Costello and Randy Newman. On the song’s lyrical side, his use of metaphor is just as impressive. He is saying that the woman in question takes things slowly versus him. And it’s that slower speed that makes the man slow down, too. In turn, she makes him a better person as they embark on the drive that is a relationship. It’s definitely one of the more creative metaphors that has ever been used for a love song’s lyrical side. Just as creative is his use of words to say that his male subject doesn’t know what the girl sees in the guy. He sings, “She doesn’t gossip au contraire/Quite demure mi amour/What she sees in me is obscure.” That line is made even more impactful coupled with its equally gentle musical backing. It’s one more part of the whole that makes this song so touching and the perfect choice with which to open the album. ’45 Mile An Hour Girl’ was the perfect way to open For The Girls. It shows within the span of a little more than three minutes the depth of Poag’s musical and lyrical talent and the talent of his fellow musicians. It does just as impressive a job displaying the influence of the likes of Bob Dylan on Poag’s own music. Just as much depth is exhibited in the performance of ‘Waiting For Me.’ This song could so easily be seen as a tune included in any stage play. That’s thanks to the general delivery of the song and the emotion. They paint a picture of a man sitting on a park bench in New York’s Central Park, a single lamp lighting the figure and the bench. One can vividly see the man sitting there singing, “Strange how we give shelter to/The images we weave/Reality a question/Of the things that we believe/Boundaries readjusted/By the lines that are deceit/And I thought the world was waiting/For me.” The way that he holds that last phrase between “waiting” and “for me” is a tiny moment. But that one moment works worlds. It especially works in the transition into the song’s bridge in which a muted trumpet enters. That section conjures thoughts of the city’s lights off in the distance as the sole figure sits on that barely lit bench, singing woefully. The contrasting visual is so vivid and so powerful. That Poag and his fellow musicians can invoke such imagery is a statement to their talent. It’s just as much a statement to the caliber of the work that audiences can expect from this record. And it isn’t the last statement, either. The opener to Vincent Poag’s new album and the slow, bluesy ‘Waiting For Me’ are both excellent examples of what makes this record such an outstanding work. They both speak volumes to the talent and creativity of Poag and his fellow musicians throughout the album. There is at least one more example of that talent on this record that stands out to this critic. That example lies in the album’s penultimate song, ‘New Orleans.’ While it is specifically Dixieland jazz, it is still jazz. It shows in its own right the influence of famed jazz composer Cole Porter. The very fact that Poag would include the song among the already varied sounds on this record shows that. Poag pays tribute to New Orleans’ rich history going all the way back to the Louisiana purchase and up to modern day in this piece. He sings of the city’s history, “1803/Louisiana Purchase/By Jefferson from Napoleon/Worldwide trading flourished/Tobacco/Sugar/The cotton gin…15 feet below the river/Mardi Gras…nothing stops the music from playing here/New Orleans.” The song as a whole is a musical love letter to one of the capitols of the music industry and of America’s culture. Any fan of Dixieland jazz will most definitely appreciate this piece. It’s unlike any of the other songs compiled for this album just as the others are unlike one another, too. That singularity displayed by each song also serves to display so much talent and depth from Poag and his fellow musicians. This includes the songs’ lyrical side as well as their musical side. Whether it be for this song or any other on the record, every listener will agree that after hearing this record, it more than proves to be one of the year’s true best new overall albums. For The Girls is available now in stores and online. It can be ordered direct from Vincent Poag’s website at http://www.vincentpoag.com and via iTunes at https://itunes.apple.com/us/album/for-the-girls/id859327192. More information on For The Girls, upcoming tour dates and more is available online at http://www.vincentpoag.com and http://www.facebook.com/VincentPoagMusic. To keep up with the latest sports and entertainment reviews and news, go online to http://www.facebook.com/philspicks and “Like” it. Fans can always keep up with the latest sports and entertainment reviews and news in the Phil’s Picks blog at https://philspicks.wordpress.com. This entry was posted in Uncategorized and tagged celebrities, Danal Music LLC, entertainment, facebook, For The Girls, internet, music, Phils Picks, Vincent Poag, Wordpress by philspicks. Bookmark the permalink.